Hey, also, if public schools are good enough for the poor people and private schools for the poor and vouchers and alternatives don’t help, then we could require the president’s children and the congressmen’s children to school in government centers too. Here’s a link to “Seismic Mike” who is seeking to articulate the connection between Christianity and libertarian thought. I’m trucking right along in my quest to argue for the Biblical support of Libertarianism. This is a tricky task. I said in my introductory post that I often find myself starting and being unable to accomplish the task. Many of you would want to quickly jump in and say, “Well that’s because you can’t!” Unfortunately, you’re wrong. It’s not because I can’t. It’s because it’s a complex issue and I can’t just simply slap a quick couple of chapter and verses on it as proof texts. There are no verses in the Bible in which we were told to vote Republican, Democrat, Green, Libertarian or otherwise. The Bible is not a political manifesto or text book. This is for two reasons. Rothbard had an opinion on “The Politics of the Apocalypse”, and quite a few had some comments to make on the subject. Wow. All this talk about Christian doctrine variants more especially in the comments from people who don’t know very much about the subject, and repeat talking points from others who don’t know very much either. Stay tuned, the only set of laws God mandated for a nation on the planet, was based on no earthly political government at all, and had no enforcement arm except the people themselves (who did a poor job of it in fact). And FORBAD taking a free man slave by the way. Almost all of us alive today were robbed of the knowledge that THE “father of modern science”, Isaac Newton, was a young-Earth creationists. Oh, and NOW we have science. (Newton didn’t I guess haha). And robbed of history. St. Patrick‘s legacy is literacy in Ireland, the end of slaving raids between Ireland and England, the saving of Greek and Roman classics by the Irish who learned to love Christ and books from Patrick, the re-introduction of learning and culture to Europe by the Irish and British monks. And the one man identified with the end of slavery in the British Empire, William Wilberforce, who was sent back to the mission field of the British Parliament for that purpose by the repentant former slaver John Newton (“Amazing Grace”). Europe’s history of Roman-heritage slavery faded away with the influence of former slave St. Patrick’s legacy, led an entire island of chiefs and serfs, and demon-worshippers and human sacrifices, Druid treat or tricksters, into the people that loved Christ and loved learning and saved many of the pagan Roman and Greek classics we have today. Libertarianism itself that owes much of its philosophy to the influence that Christ has had in culture for two millennia. The “Golden Rule” has taken a very long time to get to the place where we are now at, and has had the obstacles of many identity thieves who took the credentials of the Prince of Peace to make war on their own people and their neighbors –though never with the savagery of pagans and unbelievers gone before and after. And this may come as a shock to some Christ-haters, and some who are not so hostile, but the only government God ever really ordained directly was NONE AT ALL, outside the sense in which God is in ultimate control of it all (except where he lets you destroy yourself). Yep there were gobs of rules, and those rebellious and murmuring persnickety Jews in the Exodus that kept whining for how good they had it back in Egypt when they were slaves, they needed them. There were some penalties ordained that we see today as harsh but you can go read for yourself how fast they quit obeying them and did NOT apply those penalties. And when they demanded a government, God told Samuel to tell them they had rejected HIM. That’s a real theocracy, with no human mediator except Christ. There’s more but this is too much already. You can see more of the reasoning when my book comes available on the subject. (Which just needs editing, but that takes a budget of time or money). As to the relationship of millennial doctrines with political application, please observe that there are LOTS more atheists who are hell-bent on implementing their varied political philosophies and imposing their ways of life on the rest of us –lying platitudes from some of them notwithstanding– than there are Christians trying to run a guerrilla operation to take over. We are still tortured around the world by Christ-haters, along with other dissidents in whatever political geography, while the very loud “fag”-haters and “dominionists” can’t get more than a few dozen followers now. And I know many devout Christians, born-again believers, who believe the Bible cover to cover, who are some of the most reliable libertarians there are. They have both the spiritual, the Biblical, and the political truths on their side. Some of them condemn homosexuality with the most emphatic language when congregated but exhibited the love and grace of God with homosexuals in their support for Ron Paul, for example. Jesus did say “Go and sin no more” to the adulterous woman but just before that he said “Neither do I condemn thee”. Like the early Christians, those who understand among the people shall instruct many, and instead of killing the infidel to spread their message (like pagans, fascists, socialists, and many atheists have done) they lay down their lives like their Christ. Mr. Nocera points out in the article that during the 1970s and 1980s there was a big move to “de-institutionalize” the mentally ill. Much of this was done by the ACLU purportedly motivated by protecting the rights of the mentally ill against abusive detainment. The result was that the individuals who lacked the capacity to exercise rational judgment about the need for their own care were given the power to make decisions about their need for care. This is a personal story for me, as there was a close family member who was in and out of treatment in clinics, hospitals, group homes, locked-down care facilities in centers for study of such cases. Especially after he reached majority age, he was often able to sign himself out of such places, even after he had been initially brought there by police after acting in ways that presented a clear danger to himself or to others. It was a source of frustration over the years. During puberty and adolescence, during growth spurts and hormone changes, it was evident to me that doctors sometimes found it difficult to find the proper dosage of one or another med he was taking, even after he himself overcame the reluctance. I did not like the idea at first of him getting a diagnosis and getting drugs instead of learning to live and cope but after a couple of what I call “episodes”, I relented to the probable need for it. My reluctance had to do with his domestic circumstances in growing up that I figured may have unduly influenced his behavior habits, which manifest among many adolescents in similar “episodes”, and seeing too much eagerness in some authorities and authority figures to administer a drug as first resort when there are other and sometimes better solutions. But I had seen other situations in which one fellow mission worker, who was “normal” in all respects, became delusional after she skipped her medicine one day. That clinched it that there are cases where it is a matter of a physical problem located in the area of the brain, although I still know there have been cases of demonic possession as well, and some of those I understand have been documented. Years later, the news came to me that she had been healed, her body -including her brain- had healed, and she no longer needed the prescriptions, and had re-married. So that gave me hope in the situation closer to me, but it ended much more sadly. I love him and miss him, but I also know that he loved Jesus, he had eternal life, and that in 98 percent of his days were full of sweetness and light and fun with the kids around him. He affected a great many lives for the better, as I saw with the pleasant surprise of how many came to say goodbye to him. Answer (Not a joke): “You catch wild pigs by finding a suitable place in the woods and putting corn on the ground. “When they are used to coming every day, you put a fence down one side of the place where they are used to coming. When they get used to the fence, they begin to eat the corn again and you put up another side of the fence. “The pigs, which are used to the free corn, start to come through the gate to eat that free corn again. You then slam the gate on them and catch the whole herd. Suddenly the wild pigs have lost their freedom. Soon they go back to eating the free corn. The government keeps pushing us toward Marxist/Communism and keeps spreading the free corn out in the form of programs such as supplemental income, tax credit for unearned income, tax exemptions, tobacco subsidies, dairy subsidies, payments not to plant crops (CRP), welfare, medicine, drugs, etc. The Russian periodical Pravda is now bitterly criticizing America for implementing the platform of the Marx’s Communist Manifesto. Why does it seem like sanity is slipping out of our hands on the Internet? And these guys complain about Joe McCarthy? Hello? Knock knock! Any gray matter somewhere in there? I used to use GoodSearch a lot to help the Institute for Creation Research and other worthy causes but they use Yahoo. I quit when I got a message that “Yahoo does not authorize this site” after clicking on a link to an article that interested me. BUT I had already read that web page so I clicked on their button that said “I understand the risks. Continue”. If I had not already been there, or understood how these companies like Yahoo and Google and Facebook may posture as enlightened bastions of Internet freedom, but in policies like these they prove they are not. 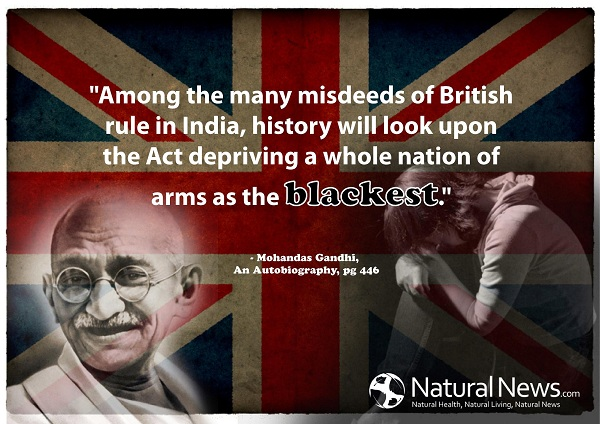 The banned quote on Facebook, that actually got the whole user banned, by Mohandas Gandhi, is “Among the many misdeeds of British rule in India, history will look upon the Act depriving a whole nation of arms as the blackest”. Maybe Gandhi learned from American history and maybe he knew why defenders of liberty Patrick Henry and Gouverneur Morris made the Bill of Rights, and the inclusion of the Second Amendment therein, a condition for letting the Constitution take effect. This in opposition to the strong federalists who already were demanding a strong central government, like Alexander Hamilton who showed his fascistic/socialist leanings with his obsessive push for a central bank owned by private bankers –precursor to the now infamous Federal Reserve. Who’s going to fight for your civil rights” when guns are “legally” confiscated and the only legal arms are cap pistols and BB guns? The ACLU, founded by Communist Roger Baldwin, defender of the Russia of mass murderer Stalin? 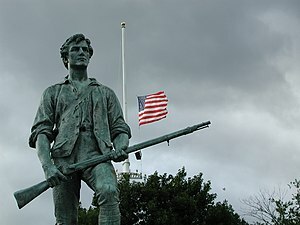 The organization that brags about defending citizens against violations of the First, Fourth and Fifth Amendment by the governments of the USA, but says the Second Amendment says those same governments are the only ones who are allowed to defend themselves against abuses of person and property, and most importantly, tyranny? That quote from Thomas Jefferson, by the way, is a favorite one of Hollywood to put in the mouths of really bad guys wanting to overthrow the government, and of course, always for the wrong reasons. That’s part of a psy-war strategy meant to Pavlov the audience by association training. They sent letters to a Virginia Circuit Court Judge and Commonwealth Attorney demanding that they convene a special Grand Jury to investigate the kidnapping and false arrest of Brandon J. Raub. They held him in a psychiatric facility without charges and the next morning a judge ordered him released and rebuked the criminal offenders. Below I copied a snip that I thought was a good compilation of the history of the tight relationship gun control has with tyranny. Someone identified as “way2confused” in an obvious reference to gun control freaks posted it in the comments section of a Washington Times article, link provided. After the list is done, he rightly points out that the country with the lowest crime rate in the world, and the lowest in gun crime, is also the one that requires all households to have one. Hitler may well have been stopped in his tracks if he had tried to annex the German part of Switzerland instead of Sudetenland, because all the individuals of the language and ethnic groups there are proud of their common political bond. educated people, unable to defend themselves, were rounded up and exterminated. SWITZERLAND’S GOVERNMENT TRAINS EVERY ADULT THEY ISSUE A RIFLE. SWITZERLAND HAS THE LOWEST GUN RELATED CRIME RATE OF ANY CIVILIZED COUNTRY IN THE WORLD!!! IT’S A NO BRAINER! tragedies to attempt to disarm the people. So there you have it, link and all. “The only thing man learns from history is that man never learns from history”. Some of us might. I was wondering when the control freaks would start grabbing guns, because there is a dollar crash coming and if/when the house of paper dollars come tumbling, and the ledger entries start shrinking, there will be a lot of angry people. The architects responsible for the collapse will throw the propaganda media into high gear blaming the victims Mom and Pop businesses who lost their wherewithal to a gang of bankers and swindlers with suits who work for those intellectual authors of the looting. The ones who abused them will get their support for seizing even more power. But there will be a great many who will know what happened, and many of those discovered each other during Ron Paul‘s historic and educational presidential campaign. They include millions of really young adults who have tasted what political and economic freedom looks like and why they are twins of the same mother. It’s not all over yet. There are very rough times ahead, because there is a rich and powerful elite that has the taste of absolute power in its mouth, and is getting ever more rabid and bold in its machinations, and they have not hesitated to use false flag operations, assassinations, coverups, moles, drone strikes, and terror plots stopped by the FBI that were engineered by the FBI. And the US certainly will have a lesser role in world history than most Americans think. It will decline in power, but then the Beast of the coming World Government will still have his hands full with rebellions against central control breaking out all over. “He shall come to his end, and none shall help him”.